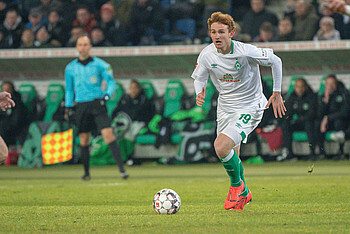 Just like his parents, Josh Sargent opted to become a professional footballer (Photo: nordphoto). As a young adult, Josh Sargent was faced with the decision of which sport he wanted to play for a professional career. This was a difficult decision from the young American as he was talented at multiple sports. Eventually, Sargent opted to become a professional footballer unlike several other Americans his age. The 18 year-old went on to rapidly develop and high expectations were placed on the young prospect. In this second part to WERDER.DE’s exclusive interview with the young American, we explore how the Werder striker coped with his high expectations and who sparked the beginning of his promising career. WERDER.DE: Josh, what is your biggest dream? Wayne Rooney was big role model for Josh Sargent when he was younger (Photo: nordphoto). WERDER.DE: That was a diplomatic answer. Who was your role model as a child? WERDER.DE: As a child, you played lots of different sports including basketball. Did you always want to become a professional footballer? WERDER.DE: Where does your sporting talent come from? WERDER.DE: Did your parents play as strikers just like you? The support recently has been phenomenal. WERDER.DE: You were forced to leave your family and your home to fulfil your dream of becoming a professional footballer. How would you rate the support you get back home in St. Louis? Josh Sargent has settled in quickly (Photo: nordphoto). WERDER.DE: Back to Werder-related matters. You’ve mentioned multiple times that there are experienced players within the team who help you out, such as Claudio Pizarro. What has helped you the most? WERDER.DE: You’re a big talent, and a lot of people have high expectations of you, especially in the USA. With that comes a lot of pressure, presumably. Do you feel this pressure? WERDER.DE: Are your self-expectations very high? Would you say that you’re a particularly self-critical person?